We are very proud to announce that we are now members of the Carlisle Ambassadors group. Carlisle Ambassadors are people who have connections with Carlisle, an interest in the city and who support this Cumbrian centre of business, tourism and culture. It is for individuals, businesses and organisations who want to make it an even better place to live, work, invest and visit. It is for those who want to benefit from a strong and influential network, and who may be interested in collaborating on projects to make a difference. Many prestigious business, charity and educational names from across the city are members of the group, including many organisations with whom we work and support: Eden Valley Hospice, Lakeland Mues, Carlisle Business Supplies, Carlisle College and Carlisle Youth Zone. The group holds regular meetings to discuss ongoing, upcoming and new initiatives which will improve the city, and help its residents and visitors. We are attending the next meeting which is held on Thursday 6th September at The Shepherds, Carlisle. The theme is retail, leisure and sport. Our managing director, Graham Jenkins will be presenting and talking about our exciting new plans for our new foodstore and what it will bring to Carlisle and the surrounding area. Karen Graham, our marketing manager, will be going along to showcase produce from our current stores, featuring many local and artisan products, including our own butchery. 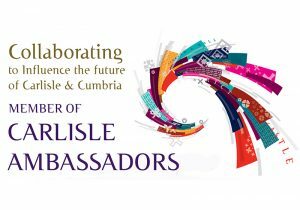 You can find out more about Carlisle Ambassadors and their events on their website. Find out more here about the other community projects and partners we work with.